« Sermon: Justin Martyr, Saint or Apostate? Chancellor Angela Merkel has received the “Lamp of Peace,” a Catholic award for seeking the peaceful coexistence of peoples. The Franciscan “Lamp of Peace” is a replica of a local glass oil lamp that glows at the monastic grave of Saint Francis of Assisi who lived until 1226 and whose observations of wildlife inspired environmental ethics. 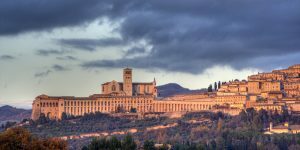 Friar Thomas Freidel told Dom Radio based in Cologne, Germany, that the award was symbolized by a “very simple small lamp” traditionally used in Italy’s central Umbria region, which includes Assisi. “The olive oil [inside] is a precious product of the oil trees of Umbria, which are similarly a symbol for peace,” Freidel said. German Chancellor Angela Merkel said Donald Trump’s decision to withdraw from the Iran nuclear deal has increased tensions in the Middle East. “We are following the events between Iran and Israel, bearing in mind that Israel’s security” is important to Germany, Merkel said on Saturday in comments reported by the Ansa newswire. She spoke after receiving the Lamp of Peace of St. Francis award in Assisi, Italy. Irreligious Europe is going to become more religious. Viktor Orbán has said the main task of his new government will be to preserve Hungary’s security and Christian culture. Orbán said his government was building a “Christian democracy”. A type of church-state alliance will come. Though it will not be permanent (Revelation 17:16). Over the past few decades the authority and unity of the Roman Catholic Church have been severely shaken. The festering issues of birth control, abortion, divorce, celibacy, homosexuality, women in the priesthood, political activism of priests and distribution of ecclesiastical power have greatly troubled the Church. Many even in the upper echelons of the Vatican hierarchy have expressed apprehension over the Church’s future. At the same time, the continent of Europe itself stands at an historic crossroads. Divided ideologically between East and West and beset with serious economic and military concerns, Europe faces crucial decisions on its future. Like the Catholic Church, Europe has been weakened by division. And both prelates and politicians alike realize that a house divided against itself cannot stand. Likewise, the Catholic Church within remains philosophically divided between liberal and conservative, despite the best efforts of unity-minded churchmen. Confronted with these realities, leading European politicians and Catholic clergymen have come to an important realization. There is only one possible course for the future, they believe. If they are to solve their respective problems, Europe and the Catholic Church need each other’s help. Their common need for unity can be achieved only by working together. Once again, the past points the way to the future. In turn, many of Europe’s political leaders see a role for the Church in their efforts. They believe the Church might once again exercise its powerful cohesive effect on Europe, providing the glue — the tie of common religion — to hold Europe together politically. Again, as in centuries past, Europeans are beginning to appreciate that religion and politics are interdependent. In essence, they are envisioning a reconstitution of the whole of classic Europe, along the lines of the old Holy Roman Empire, under Catholic aegis. This confederated Europe will be an immense political, military and economic power — a great Third Force in world affairs, a superpower in its own right. Prophecy further reveals that this powerful church-state union will be composed of “ten horns” — meaning 10 nations or groups of nations (Rev. l7:3) — under the overall leadership of a single political figure (verse 13). Europe will again have a single political head of state! Now notice further: In the second chapter of the Old Testament book of Daniel, the Roman Empire and its predecessors are pictured as a giant human figure. The figure’s 10 toes correspond to the 10 end-time national units also described (as “horns “) in Revelation 17. The prophecy of Daniel reveals that these 10 entities will constitute a political system that will exist at the return of Jesus Christ to establish the kingdom of God on this earth (Dan. 2:44, 45). So, European unity has been pushed by the Vatican for a long time and politicians have essentially called for Europe to be given “a soul,” in this context meaning religion. In particular, a religion that the Vatican will endorse. Since that WCG article was published, Eastern Europe did depart from being part of the old Soviet Union and much of Eastern Europe is now part of the European Union. The Bible says that this revived European power will be militaristic (Revelation 13:1-4), dominate the economy (Revelation 13:16-18; Revelation 18), and destroy the USA (Daniel 11:39) and its Anglo-Saxon allies (cf. Daniel 8:24-25), and it will also destroy a power to rise up in the Middle East and North Africa (Daniel 11:40-43). Like Daniel’s fourth beast, this many-headed creature of Revelation 13 also has close ties with a priestly potentate. According to John: “Then I saw another beast which rose out of the earth; it had two horns like a lamb and it spoke like a dragon [reminiscent of a wolf in sheep’s clothing]. It exercises all the authority of the first beast in its presence, and makes the earth and its inhabitants worship the first beast . . .” (verses 11-12). Here we see what amounts to a state-supported church using authoritarian methods in order to force people into religious idolatry. To facilitate the process, the second beast has an image of the initial state system erected (verse 14). An autocratic state organization becomes an effective model for an ecclesiastical hierarchy bent on maintaining an iron grip on the religious thoughts of its subjects. This particular pattern of church and state authority was put to use during the Middle Ages. The medieval church was organized along patterns previously established by Imperial Rome and effectively maintained an exclusive religious monopoly throughout the Western world. Men feared the power of – the church more than virtually anything else in their lives. In that sense, the church operated by using its own structure as an object of worship. Under the Nazi Third Reich the pattern was reversed, as political party modeled itself after the church hierarchy in order to maintain control over the minds of men. This type of church-state totalitarianism as described by John has raised its ugly head in successive revivals throughout most of Western history. And while the book of Revelation does have an ongoing historical fulfillment, its main emphasis is on events that will occur during the climactic end time just prior to the return of Christ. Not only will people be taken in by the beast power’s religious sleight of hand, but they will idolize its military exploits as well. In such an atmosphere it’s no surprise that the other three horsemen of the apocalypse war, famine and pestilence will be riding at full gallop. During this tumultuous period of time, there will be a few stubborn souls, known as the “elect ” (Matt. 24:24), who will not be taken in by this marvelous church-state mega machine. As we have already seen, this can and will be extremely .dangerous to life and health. The resurrected church-state system, like its predecessors, will not tolerate dissension in the ranks. Under the circumstances, its actions will be very predictable. Religious persecution will be at an all-time high. As John wrote: I saw the woman, drunk with the blood of the saints and the blood of the martyrs of Jesus” (Rev. 17:6). This European power will involve religion (cf. Revelation 13:4,8, 16:13). Persecution, signs, and wonders will persuade nearly all to support that (Revelation 13:11-18; 2 Thessalonians 2:9-12). This will not end well for Europe (cf. Revelation 17:14). What Europeans need to do is repent (Acts 2:38) and to “contend earnestly for the faith once for all delivered to the saints” (Jude 3). But that is not something that many there understand. Details on the history and doctrines of the true Christian church can be found in the booklet: Continuing History of the Church of God. Those who will not embrace the teachings and practices of the original and true Christian church will be deceived (cf. 2 Thessalonians 2:9-12). The end time final Mystery Babylon is in the process of forming (watch also Do You Know That Babylon is Forming?). This entry was posted on Saturday, May 12th, 2018 at 7:45 am	and is filed under Religious News, WCG News.